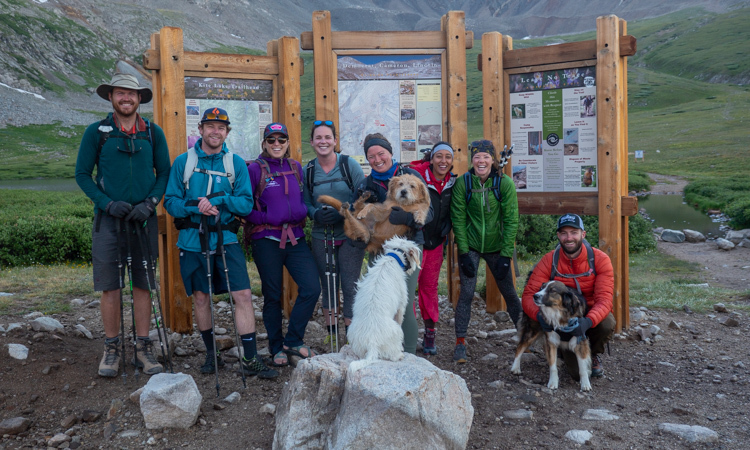 In the early hours of Monday, July 9th, eight heavy-eyed, coffee-fueled individuals met at the Kite Lake trailhead near Alma, Colorado and began the initial climb up the three mountains they planned to summit that day. The three fourteeners (peaks reaching above 14,000 feet above sea level) sat in a pleasing loop. The loop is named the Decalibron Loop, a mash-up of the names of all of the peaks (three official fourteeners and one unofficial) you hit along the way: Democrat, Cameron, Lincoln and Bross. Tackle over 7.25 miles and 3,700 feet of elevation gain, and you can summit all three peaks and walk away feeling like a champion. 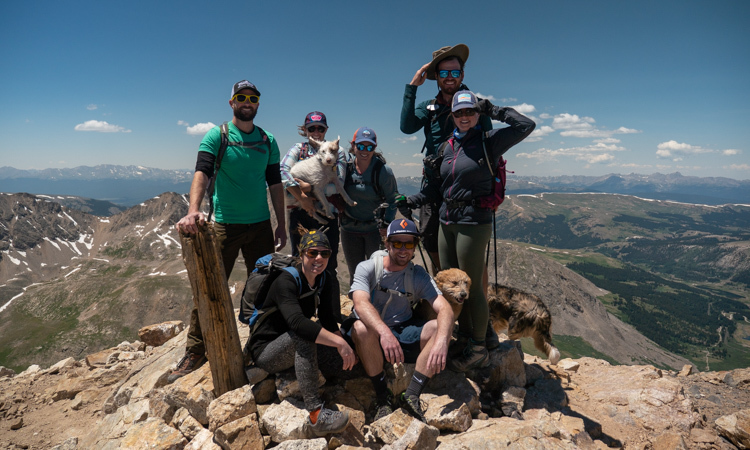 The group of eight (plus three pups) comprised of team members from both Elevation Outdoors and Big City Mountaineers, were all there as a part of a challenge to raise money for Big City Mountaineers through the organization’s Summit for Someone program. BCM provides wilderness experiences for under-resourced youth and serves as an awesome non-profit committed to helping tons of kids experience the outdoors and hopefully, learn to love it and take care of it. According BCM’s website, the organization works alongside the transformative powers of Mother Nature to leave a lasting impact on the lives of under-resourced youth. 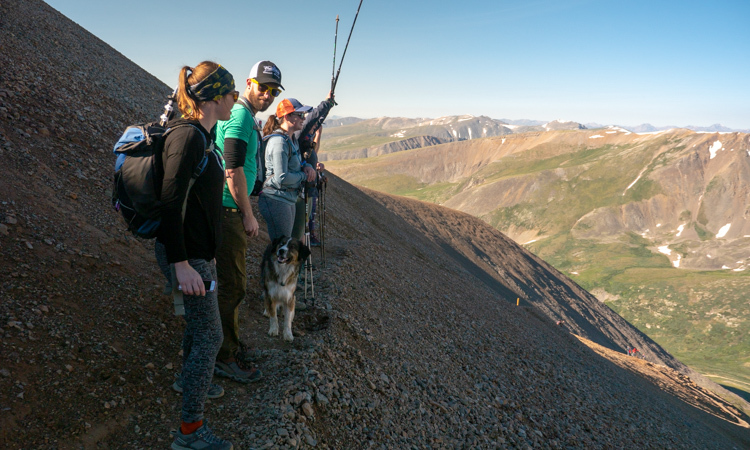 Elevation Outdoors did a custom trip with Summit for Someone, but there are plenty of pre-planned trips where you can pair up with a group and a guide to summit the mountains you’ve been dreaming of. You raise and donate a certain amount of money for the organization, and they provide the guide and adventure. At 6 a.m. during the Colorado summer months, mother nature is already in full swing. The sun is up, the birds are singing and plenty of fellow hikers have already left for their adventures. We stuffed our bags with snacks and started hustling. 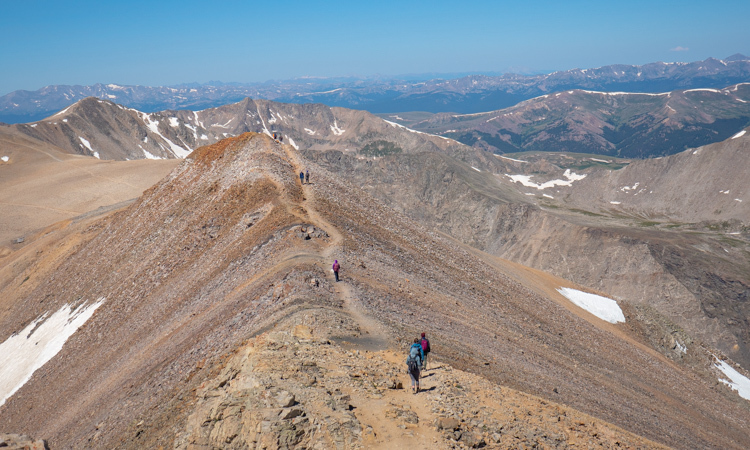 The fourteener game is 1/4 fitness and 3/4 mind games. 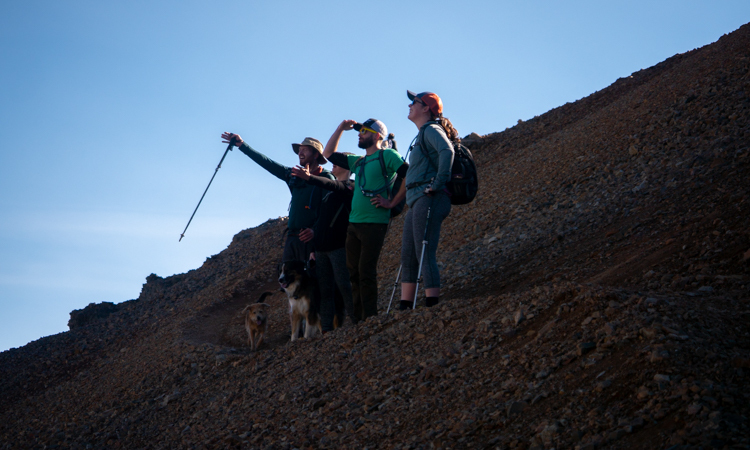 For most of the journey, you are looking up at what seems like an impossibly far, high, hard-to-reach goal, which is probably a false summit anyways. The higher you go, the less pressure there is (literally, not figuratively), and the more room oxygen molecules have to spread out. The farther apart the oxygen molecules, the less you are breathing in, which means less oxygen is getting to your muscles (and brain). 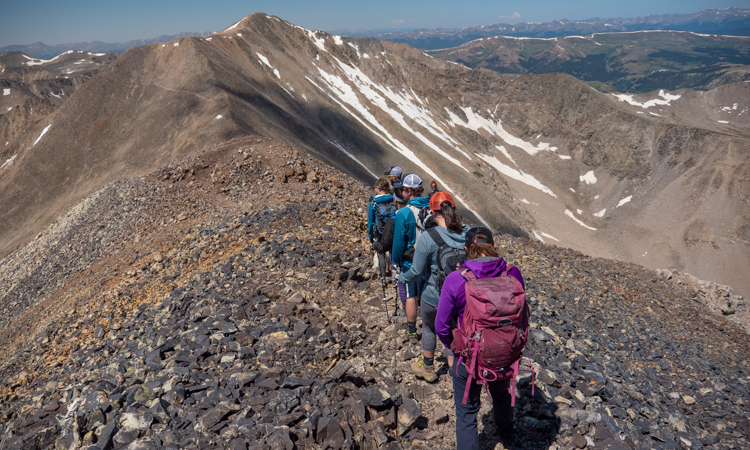 At some point in every fourteener hike, you fight headaches, nausea and fatigue. Of course, this trip was no different! One by one we ticked the fourteeners off in a huffing and puffing line up and down, up and down. We chose to summit Mount Bross first (although due to land ownership you can only technically get within 192 verticle feet of the summit). Kite Lake campground, the beginning of the loop, sits at 12,030 feet and you head up loose scree all the way to 13,980 feet. 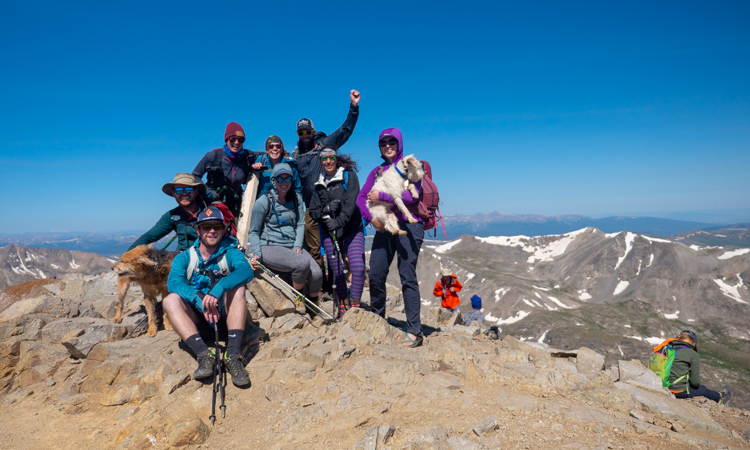 With a huge climb out of the way, we had the pleasure of meandering over to Mount Lincoln, and finally, across Mount Cameron (an unofficial fourteener because a mountain has to gain at least 300 feet of prominence off the ridge to be considered an official fourteener; sorry Cameron! 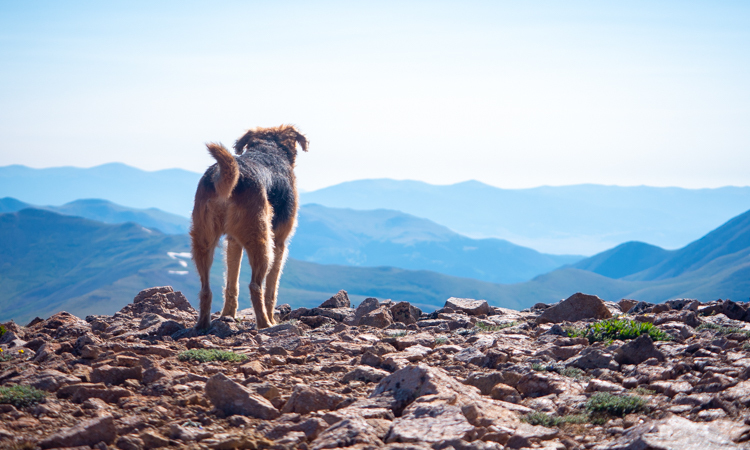 ), on up the daunting summit of Mount Democrat. 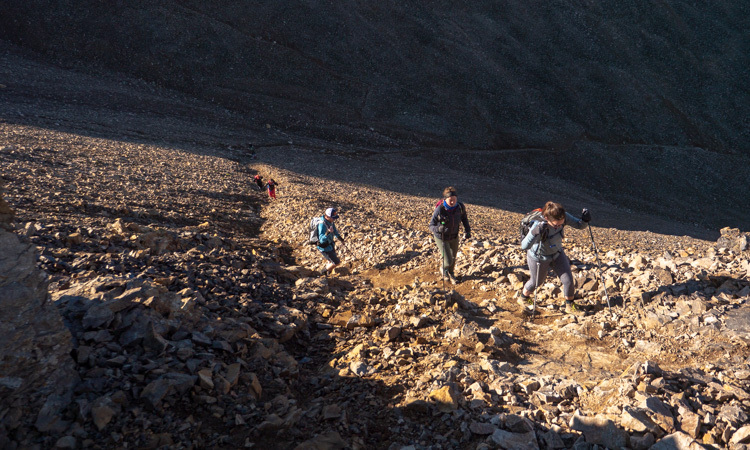 Then we tackled the long descent back into the valley with tired knees, achy muscles and gratitude for hiking poles. 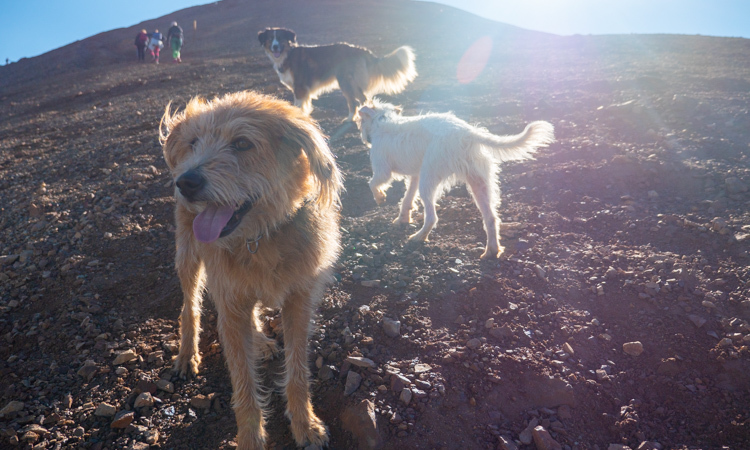 The dogs were energetic the entire way, and our jealousy was palpable. We had a crew of mixed ability and experience, but everyone stuck together and smiled up the climbs. 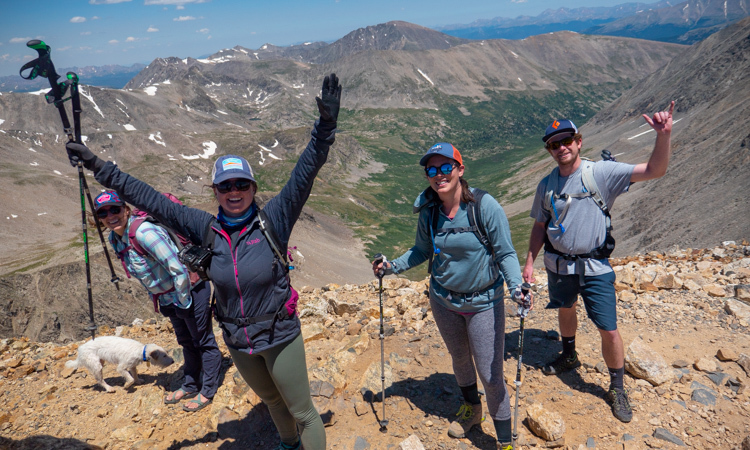 Elevation Outdoor’s newest intern, Sophia, had only been in Colorado for three weeks (coming from sea level Florida) and had never climbed a fourteener before. She chugged along with the rest of us and showed incredible lungs on the climbs. Megan, from Big City Mountaineers, and her husband Andrew, led the pack with confidence. Conor, our Elevation Outdoors rock in the office, supplied Dad Jokes the entire way up, something we all were extremely thankful for. 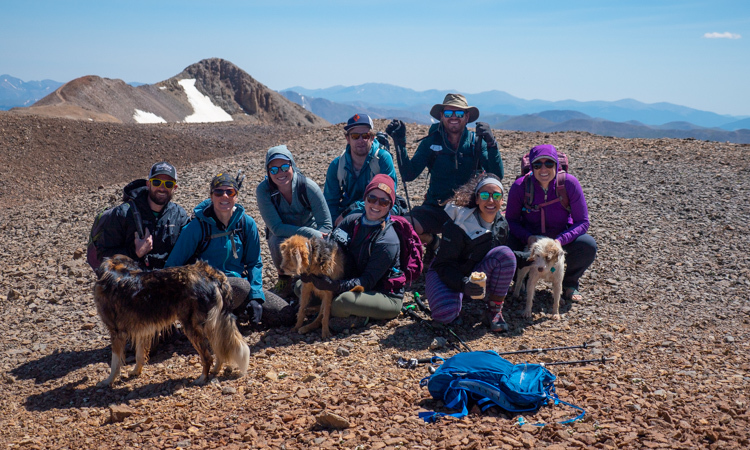 If you also enjoyed Conor’s Dad Joke, and our summits story, our Summit for Someone fundraising page is still up and accepting donations. Although we’ve completed our climb already, any and all donations will still go to BCM to support getting kids outside. Below are our three summit group pictures. We did it! Three fourteeners down, and so many more adventures to go. Find us next in Salida, where we are helping reshape Double Rainbow Trail, a mountain biking trail near town on Saturday, July 14th, 2018. For more info click here!